Are you having a "Good Day?" It all happened so fast. He woke up one morning and told his daddy he had to go potty, and then it was like we were buying big boy undies and researching methodologies in the previously uncharted territory of Potty Training. And then it's like, we became obsessed. "Liam, you have to pee pee?" "Liam, honey, you have to poo poo??" "Liam, sweetheart, you're holding your wiener, let's try to potty." "Liam, love, why didn't you potty just now? What are the words we use when we have to go?" My husband actually took the reigns of this little adventure. After all, he's the man, right? And Liam is technically a "Little Man" and all the parts are the same. Why not? 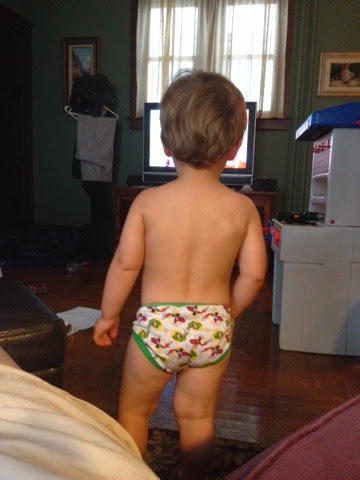 After two days of letting him run naked and discussing the anatomy of it all, it was time to go buy the MUCH anticipated "Jake Big Boy Pants"
We then started taking the potty everywhere with us. Everywhere. To movies in the park, to concerts, on trips...everywhere. And he was doing really, really well. People judged us for taking the potty everywhere, but you know what? My kid also wears a leash when we're in public. Mind your own dumb business. Yesterday Liam didn't do a good job on the potty at my mom's house. He would poo, but not pee, and then throw major tantrums and then do it on the floor. He went through all his undies- every single pair. Today I called again, "Is Liam having a good day?" Nana reported yet another bad day. Peeing on the floor and not sitting on the potty. Making himself stiff and throwing himself on the floor when it's time to use the bathroom. I started to cry. Like it was somehow my fault that my 21 month old son was rejecting a previously victorious task. Like it was somehow within my control to make my child well behaved for my mother at the ripe young age of "barely two." Maybe we should stop the training. Maybe it was a fluke that he did well for two weeks, sometimes going through the night with a dry diaper. For a moment I reflected on the question I was asking. "Is Liam having a good day?" What does that even mean? Is Liam obeying and peeing in the potty and not climbing on anything and sharing and napping and listening to instructions and... And fulfilling all the tasks his fully grown, 29 year old mother wants him to? I should have just asked "Is Liam being the perfect child today?" A better question to pose, "Was Liam sitting like a little prince with his socks pulled up and his hair combed?" "Was Liam doing all the things that he should and all the things he shouldn't?" "Was Liam living up to the lofty expectations I have for him?" What if this question was asked of us daily? "Was Libbie the model employee today at work?" "Did Libbie fulfill the expectations of a mother and wife today?" "Did Libbie make any mistakes today?" Holy crud buckets, what was I expecting of my child? On a side note, those are the kids who get mothers shunned at play group. In a world of "normal" children, nobody wants to play with the "perfect" one. They're just not...fun. They have no stories to tell. ("Well, there WAS that one time little Timmy didn't finish his supper...") Loser. Everyone loves a good, "And then in an attempt to take his plate to the kitchen like I asked, Liam dumped it all over the floor. And then when I was down on the floor picking up rogue corn, he decided to pee himself right in front of me, even though the potty was sitting two feet away!" You've never heard anyone ever say, "Please stop telling hilarious stories about your super normal toddler." So. Are you having a good day? I'm not. But screw it. The heat has made me so sleepy that even my "awake" medication is like taking two Smarties in the morning. I'm making frozen pizza for supper. Oh sure, I'll stop for a salad on the way to try to even out the laziness with the vegetables. Our kitchen is currently so full of dishes and since it's the size of a postage stamp and there's nowhere to put anything, I put a plate on the floor last night. That's right. I said it. I put plates on the floor because I was SO stinking tired after working and teaching and cooking supper in my hotter than hot kitchen, I didn't do dishes. I cleaned up corn and pee and then I collapsed for the night. Please let me be remembered for not all the "good days" I've had, but the days where I've given it my best try and prayed for grace. Those will amount to more in the end anyway.